[By Nick] ‎I already know what you're thinking, "Nick, why are you reviewing So Delicious limited edition bars for FALL?" Well there was a miscommunication at So Delicious that resulted in me not getting these bars until earlier this month. "Well, don't they have a Winter line you could be reviewing instead?" Yes, yes they do. However, like the fall bars, those are also exclusive to Whole Foods. It seems that Whole Foods had bought them out of their own inventory so you guys are left with a review of a couple bars you might still be able to find or will have to more than likely find next year. Hope you enjoy! Okay, I'm going to admit, I was very excited when I heard that these were going to be produced. I'm one of those people who loves candy corn anything and hordes it when it comes around in the Fall. I know there's a group of people just as opposed to it as I am in love with it so let's just save that debate for another day. Now there's already a big problem with these bars and I didn't even have to open them to realize it. While the box graphics show the proper color scheme for candy corn, the bars do not eliminate them at all. There's not even chocolate involved in candy corn. If you want that, then you're looking for Indian corn instead. I think this is the true reason people are against vegans. It's not their lifestyle choices (I have a bunch of vegan friends btw) but it's because they don't know what exactly candy corn is! Okay enough with this, let's open this box up. I like the branding on the bar. It's those little touches that make me happy even if the wrapper doesn't distinguish what flavor it is. Slicing the side to get a cross section photo and there's a problem. I was hoping the chocolate coating would be covering the yellow layer but I was wrong. I know it's superficial because it's just coloring but I have a passion for candy corn! There's also a citrusy smell coming from the orange segment... They better not have... they did... The orange segment is indeed, orange flavored. While tasty when mixed with the notes of coconut flavor, this is sacrilege when it comes to candy corn. 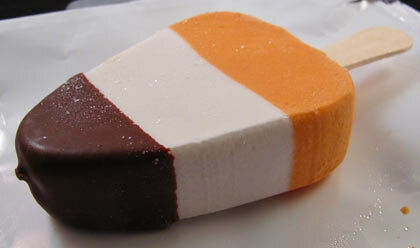 The white layer just tastes like their normal vanilla coconut milk base which is fine but isn't candy corn. The chocolate coating is better than I was expecting and is of good quality. Thicker and sturdier than I would've thought as well. 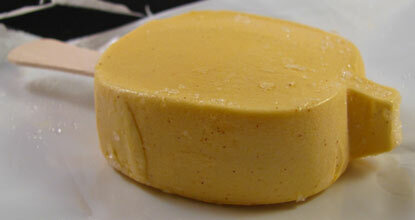 It's definitely more on the dark side and works well with both the vanilla/coconut and orange‎ frozen desserts. 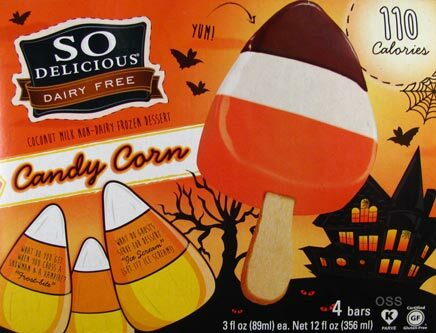 The problem here though is that besides the bar's shape, nothing about this is candy corn at all. Not even remotely! This is a good novelty but terribly misleading. I was not expecting the orange layer to taste just like oranges at all. If you're going to do that, put a description on the box or something. You can't just brand something as one thing and make it nothing like what it's supposed to be. Meh, onto the next! Okay, this bar gets points for the punny joke on the box. Puns are always welcome in my book. Ahhh pumpkin spice, how you've been in abundance this year. One of the main reasons I wanted to review this bar still is because Dubba promised we wouldn't be doing anymore pumpkin products this year. Dubba is now officially a liar! Muahaha. [Dubba's Note: So tempted to cut out this half of the review.... you know, for integrity and stuff]. I'm only kidding, if that happened id refuse to review anymore vegan products. 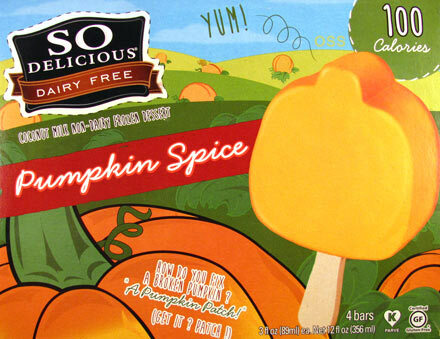 These bars do in fact taste like pumpkin spice. Well pumpkin spice that made out with a coconut. It's actually a really good combo. I think they could've even went as far as to include that chocolate shell they had for the candy corn bar to make these better. Maybe to cover the stem or give it a face like a carved pumpkin. So Delicious, you can use that idea for next year. Note about both of these bars though: the consistency is nice and creamy when you let them temper at room temperature for 5-10 minutes. There's no way you're enjoying either of these straight out of the freezer because they're very dense and hard otherwise. Honestly, I would be willing to eat both of these bars again. Well as long as the candy corn added a disclaimer or was just renamed completely. I'd imagine the pumpkin bars were a bit hit this year among the vegan and non-vegan crowd. Thanks again for So Delicious hooking me up with these bars as well as a few others from their year round line that will be covered sometime in the future. I tried the candy corn bars and was very disappointed. I agree 100% with your review on them. They taste nothing like candy corn. I had high expectations, too, because I love So Delicious products.